Sometimes there is just nothing cuter than mother and daughter matching outfits. For one, they make for great photos ops and are a great choice for holidays like Easter, Mother’s Day and more. If you have to go somewhere with your daughter for a formal occasion, tutu dresses are perfect idea for matching outfits. On the other hand, you can choose a full length gown for you and your daughter and you will look stunning either way. If you opt for a more casual style, you can combine a maxi skirt and a T-shirt. You can even match accessories such as hair ribbons. If you like street style, the combination of jeans, a cardigan and ankle boots is perfect because it is comfortable and your daughter will enjoy wearing it. Order same skirts for you and your daughter. Having an identical skirt is a very practical because you can pair it with anything you have in your wardrobe. The easiest option is to buy dresses in the same color. A clean white dress is super special for any summer event or Easter in warmer climates. You will look adorable! Even though buying two matching dresses is the easiest option, making an outfit of what you have in your wardrobe is much more fun. So, you can, for example, match favourite leggings and a shirt. Your daughter will feel comfortable in leggings. You can also add a cardigan for this combination. Here is another idea. If you have a printed fabric, you can order a custom made skirt for you and a dress in the same fabric for your daughter. Pair it all up with a hat and you get the perfect combination. Use your imagination and have fun. Gabriella Diesendorf is a working mom and a freelance writer for several beauty and fashion blogs. She’s an art historian with great passion for all things regarding beauty. 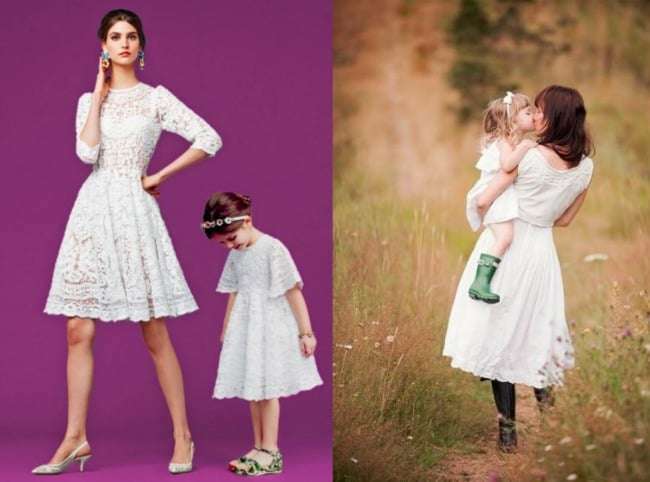 She found inspiration for this article after buying Hello Molly white dress and matching it with white dress she got for her daughter. Have you ever had mother daughter matching outfits? My mother wasn’t big on matching when I was growing up but my niece is 12 and still thinks it’s cool to dress like her mom. I like how some of these options aren’t identical but still complimentary in style or design. Super cute! My mom and I never did this but she always dressed me to the nines, lol. My mother was not one for dressing me up. As a matter of fact it was my father who bought most of my clothes. These photos are adorable. a title that grabbed people’s attention? I mean Too Cute! has aided me out loads. I am hoping to contribute & help different customers like its helped me.